It was Montage Mountain Ski Area then Sno Mountain and now it is once again Montage Mountain. Whatever the name, Montage Mountain, Scranton, PA, is one of the biggest and best of all the Poconos ski resorts. Located just a few miles from downtown Scranton, only a few hours from Philadelphia, Montage Mountain ski resort has a vertical drop of 1,000 feet, just a few short of the states largest (Blue Mountain Ski Resort). The summit is at 1960 feet, but the ski area parking lot is at neither the top nor the bottom, but at mid-mountain. This means you can boot up and ski your first run without waiting for a lift. Depending on your ability, you may want to take a lift first anyway. The top of Montage Mountain ski resort is rated mostly green and blue, and several lifts serve this area. Experts will want to ski the steeper runs toward the bottom, although at times the snow isn’t as good. Also, you need to go all the way to the top to take advantage of the longer runs which the full vertical drop provides. The steepest section on Montage Mountain—and one of the steepest runs anywhere in the state—runs about 300 feet on the headwall of double-black rated White Lightning, which drops off at an impressive 30 degrees below the parking lot (all the way skiers left from the Phoebe chair). Stick to the Phoebe chairlift to loop this and the other blacks at the bottom or head up the Long Haul lift to get the full vertical drop. The top of Long Haul access several blue slopes, and upper-level intermediates should not struggle with the single-black runs down to its base. 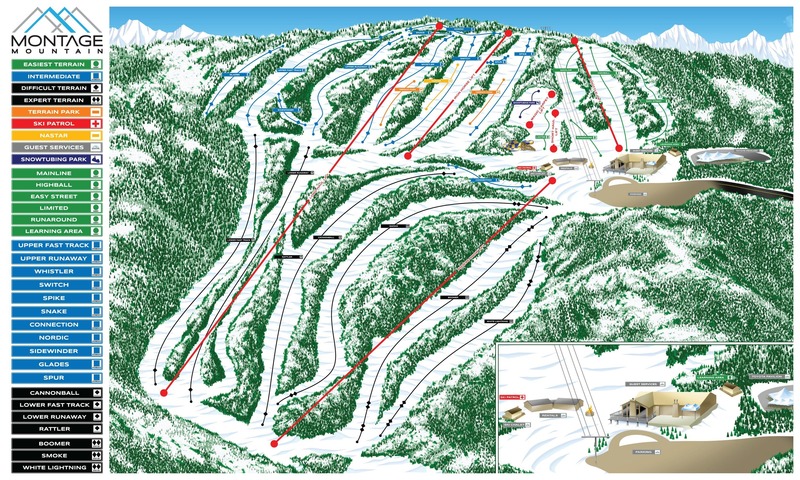 Near the summit of Montage Mountain ski resort, Switch trail has a NASTAR racing course. Next to that, Whistler trail has a smaller terrain park and Spike has a longer one. You can loop these on the Iron Horse lift. 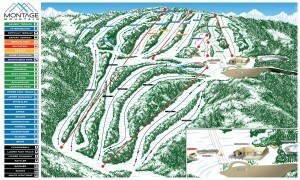 From the lodge, the Shuttle lift serves gentle green runs, including winding Easy Street and the wider Highball. There’s also a kiddies learning area right next to the lodge. In addition to the skiing, Montage Mountain also claims the longest snow tubing runs in Pennsylvania, with designated lifts near the lodge. In the summer, it transforms into a water park. Formerly land owned by the Pennsylvania Gas & Water Co., the original Montage Mountain Ski Area was developed by the county government of Lackawanna County using federal economic development funds. Purchased by the county in 1979, Mountage Mountain Ski Area opened to the public in December 1984. Lackawanna County divested its holdings, and sold the ski area to a Philadelphia-based investment group for $5.1 million in 2006. The ski area operated as Snö Mountain until 2013, and Sno Mountain LP invested $3 million in snow-making equipment, added new ski trails, and built a terrain park. The group also spent $12 million to build a water park, which opened in 2008. The investment did not pay off, and the company defaulted on a $5 state loan and filed for bankruptcy in 2012 with $24 million in debt. The new owners, real estate company Jefferson-Werner, restored the Montage Mountain name when it bought the ski resort in May 2013 for $5.1 million.